As I slowly recover from my foot surgery and deal with try to be patient I found this story to be a good lesson about the faithfulness of God. It was an exciting day when Ruth Priscilla married the handsome Thomas Alden Colbath, a jack-o-all-trades from a nearby town. She had been born and raised in the same house in Passaconaway Valley, New Hampshire, and it is in this same house that she and her new husband made their home. Her dreams had come true! One day, however, in 1891, as 41 year-old Ruth was preparing dinner, Thomas left the house, telling her that he would 'be back in a little while.' She had no idea where he went, but she was sure he would be returning that night and would need a light to guide him home. 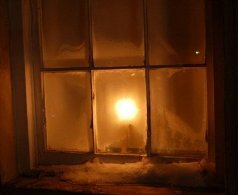 So she lit an oil lamp and placed it near the window. But he didn't come home that night. Nor the next nor the next. When days turned into weeks and weeks into months, she began to get discouraged. Where could he be? Had he been hurt? Did he still love her? But he had said he would be back, and she never doubted his word. They had a bound that couldn't be broken! For the next 39 years of her life, Ruth placed a lamp near the window every night. Often she would gaze out of that same window with longing, ever anticipating Thomas' return. At such times she would dream about that day. She imagined the tender embrace, the tears of rejoicing that would be shed. She couldn't wait for the day her Thomas would return! And Thomas did return. Three years after Ruth's death. He had been away for 42 years. No one ever learned why he had been away for so long, but all he found upon his return was the mound in the burial plot near the house where she lay. As she faithfully awaited her husband's return, Ruth truly learned the meaning of the word patience. May we learn that same kind of patience when we ask for guidance from the Lover of our soul. Too often however, when He doesn't reply according to our time table, we forge on ahead, acting on our assumptions, and usually regretting the results of our actions, results that could have been avoided. Too often we forget that our God indeed will answer us. But to tell the truth, we probably relate more with Thomas, the wanderer. He loved his wife, have no doubt about it, but his priorities led him away from what was truly important to him. Imagine the day he returned to find his house deserted, with only a tombstone bearing his wife's name to greet him. It was too late to appreciate the one he had come back for! We, too, tend to wander away from what is truly important to us. No one has ever shown us such love! Our Savior, dying on a cross, for us! Unimaginable, but true! And we love Him, but the priorities of our lives tend to drive us away from Him, robbing us from the time we could spend discovering how awesome He truly is. Our society isn't geared for God! But one day, we, too, will die. One day it will be too late to wake up from our stupor. One day we may regret the life that we led while we were pretending to know the One who came to save us, but in reality, we didn't know Him intimately at all. Maybe today is the day for us to wake up and realize what truly matters to us. Tomorrow may never come! Ruth had faith in her husband. She had hope. Thomas would return! She had an ardent love for the one who had abandoned her. If you are wandering, remember that the Lover of your soul has a Light in front of His window shining quite brightly, for He, too, is waiting patiently for your return. He loves you! Dear Lord, help us return to the light that You have put there to guide us. Help us not let the business of life get in the way of our relationship with you. In Jesus’ Name, Amen.